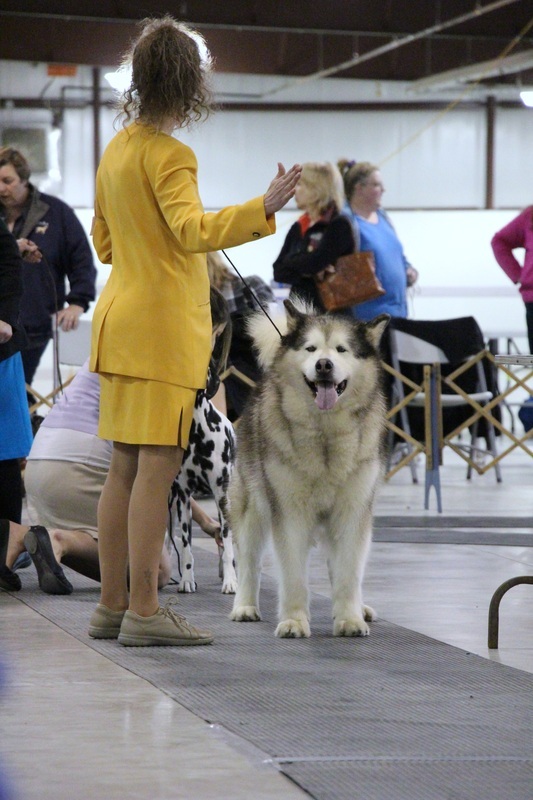 Best in Show (BIS - altered) Yukonjak's Ernie, CGN, TT, HIC - at nearly 11.5! April 2013. 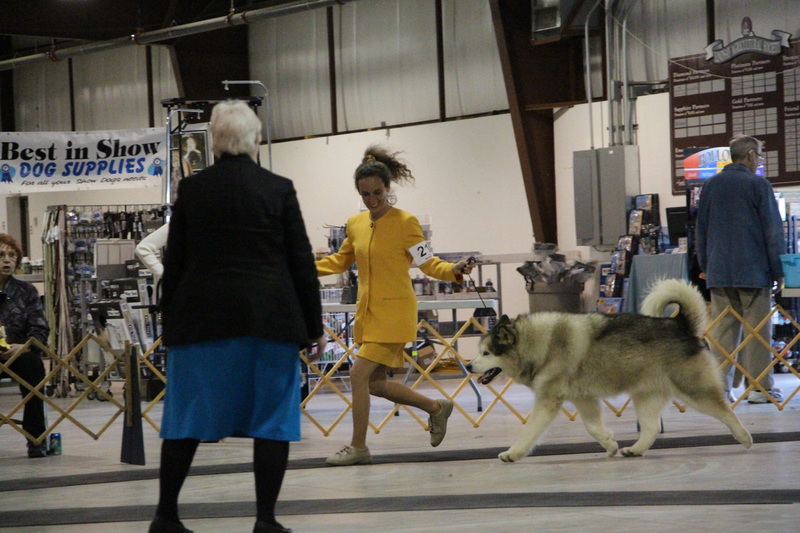 Best in Specialty Show (BISS - altered) Yukonjak's Ernie, CGN, TT, HIC - almost 10! September 2011. Ernie, almost 11.5 years, on his way to a CKC 'altered' Best in Show! Ernie, self-stacked at 11.5 years of age. Obedience trained since tiny puppyhood, he didn't start 'dog shows' until after he was nine years of age. I have many good photographs of Ernie from over the years! 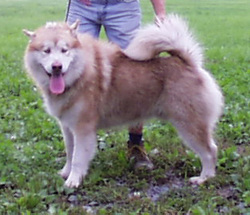 Ernie arrived as a companion for my first Alaskan Malamute, Tala, so he is neutered. While he is not related to Bert, he is Bert's very best friend. With Ernie, I learned about weight pulling! I took Ernie to Pack and Pull one year and he pulled a few hundred pounds. I thought that was fun, so I took him back the next year. 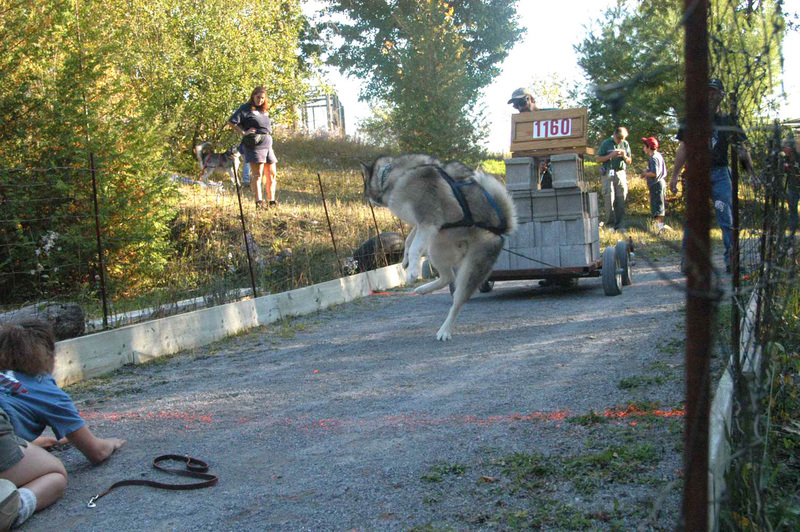 His second pull was almost 1300 pounds and he won the entire event, pulling more weight than any of the other Alaskan Malamutes. Ernie has won every weight pull competition - his class and event - available in Ontario on multiple occasions and has about 15 gold medals and first place wins in weight pull. He was retired at nine years, after winning his final gold medal. Ernie has had quite a few health tests, in spite of being 'only a pet' and it is his OFA excellent Xrays for his hips and elbows that I have posted to show people what they are. He has other OFA certifications too, and you can see them on the list to the ride side of this column. 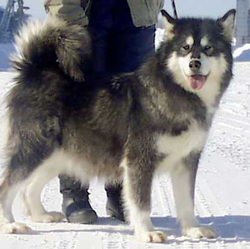 Ernie, like my other dogs, eats a RAW or Barf diet for Alaskan Malamutes. Ernie is neutered / altered so he can't be shown 'for real' - but it hasn't stopped him from doing other things. He has met the requirements for two working titles, though I haven't sent any of the paperwork in for them, and has three behavior / temperament tests - including one for herding sheep! 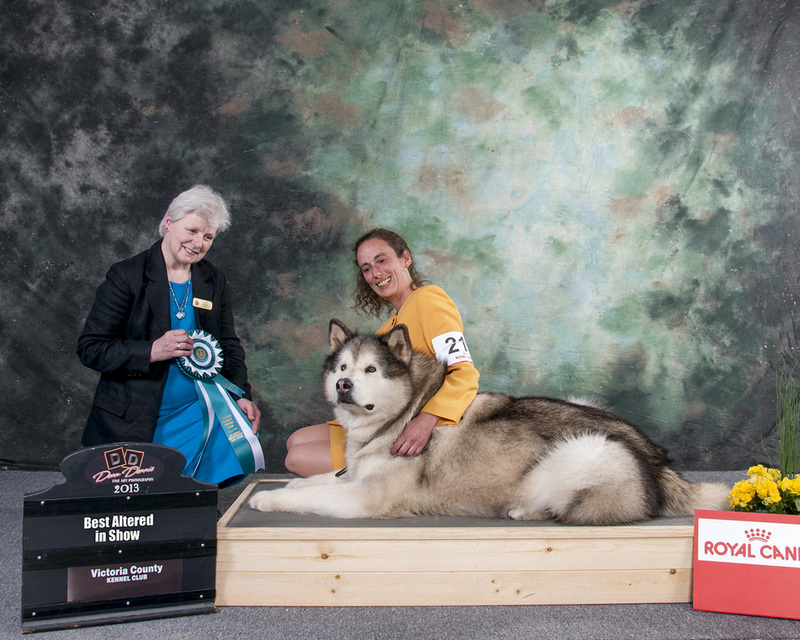 He has attended many info and working demonstrations for the Alaskan Malamute HELP League and the Alaskan Malamute Club of Canada during his life and is as a well‐behaved breed ambassador. Ernie began his 'altered conformation career' his with the Canadian Kennel Club at just over nine years of age - and finished just short of being 11.5 years of age. with four or five shows. day after his ninth birthday! 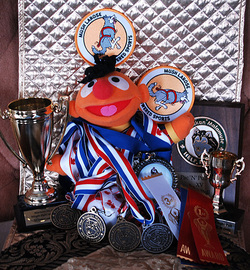 Ernie's 'stand-in' with his working medals, trophies, ribbons and plaque. 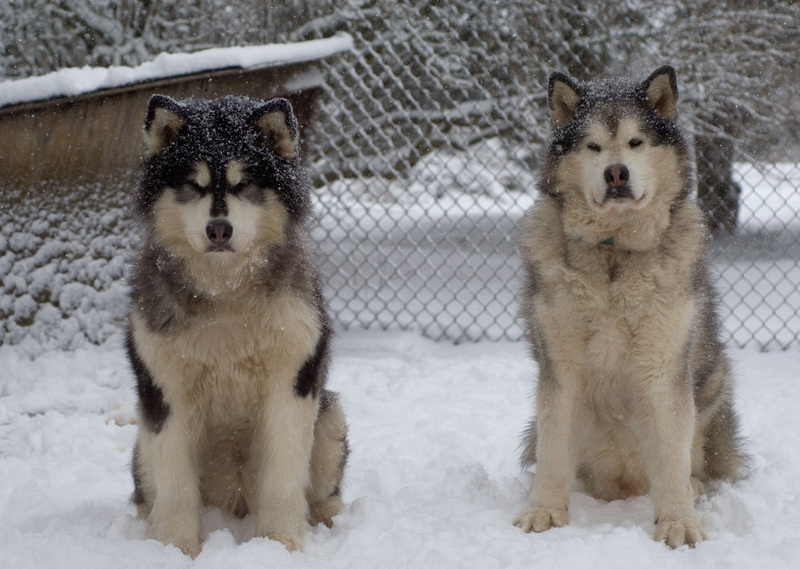 Queen Ooky and King Ernie during Winter 2012. Ernie, at a weight pull, around three years of age. Ernie, 'demo-ing' at a weightpull, on his ninth birthday during 2011!